Evernote APK 7.9.3 is recommended for those who need to manage and organize your office notes neatly. You can find this note application under productivity label on Google Play Store. The app is easy to find since it has black elephant head logo on green background. The Evernote Corporation uses elephant as their logo since this animal has good long-term memory. It is designed to help you memorize and collaborate notes. Although you can download and install it for free, in-app purchases are implemented on it. It has several features that you can use to improve your working productivity. The application allows you to collect, capture, and writes notes. The system of this application allows you to manage those notes into certain categories according to your need. The form of notes that can be managed on Evernote includes checklist, to do list, notebook, and many more. It supports various formats. Besides text, you can also store images, videos, and audios easily. PDF files and website capture can be stored in the application as well. If you want to scan a document to save it as note, you can use your smartphone camera. It can also attach various types of files including Microsoft Office and PDF. The best thing about this application is that you can synchronize it on your computer, tablet, or smartphone. It is not only support your mobility, but also provides easy access. You can work with your computer in your office and continue working at home with your tablet or smartphone. 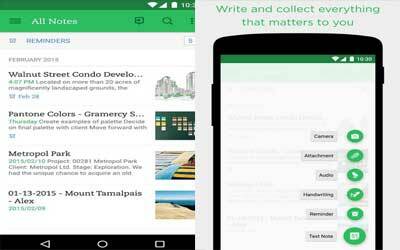 Besides used for office works, you can also take advantage of Evernote for academic purposes. You will be able to save academic research on this app. Evernote for Android also has sharing feature that allows you to do group project and share ideas with your classmates. Google Drive Integration! Add docs, slides, sheets, and files from Google Drive as attachments or descriptive links without leaving Evernote. The links are formatted as tappable objects that are easy to find in a note. It’s easier to make notebooks available offline now. Squashed a bunch of bugs!